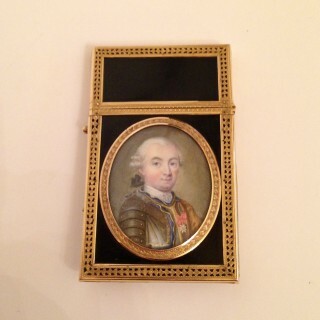 Fabulous high carat gold Carnet de Bal with the warden mark of Paris 1771-1772 and charge mark of Julien Alaterre goldsmith to Louis XVI and Marie Antionette. 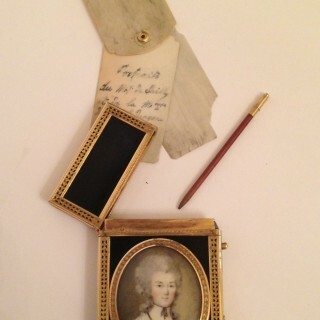 Beautifully painted miniatures on ivory set in gold frames with enamel surrounds.The interior has the original aide memoir, Ivory leaves swivelling on a gold mount ring. 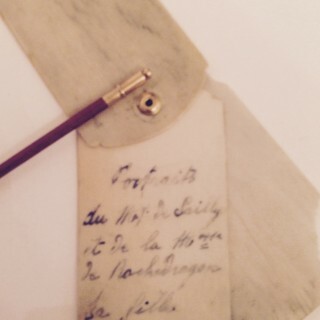 One of the leaves has written on it with probably the original gold topped pencil which is found within, Portraits of…. the Marquis Jean Francois de Rochedragon 1744-1816 and his wife Adélaide Félicité de Sailly 1753-1785. She was the daughter of le Brigadier des Armées du Rog Louis XV1. 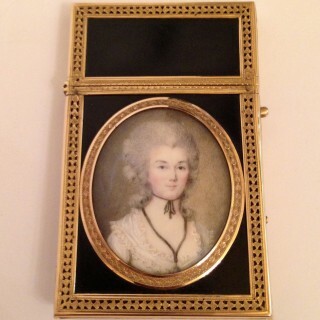 She married the Marquis de Rochedragon in 1773 He survived the revolution being thought of well and died in 1816. This Carnet de Bal is believed to be a gift from Louis XV1 and Marie Antionette to the Rochedragons on the occasion of their wedding in 1773. The Rochedragon family home was Chateau de Bouges. 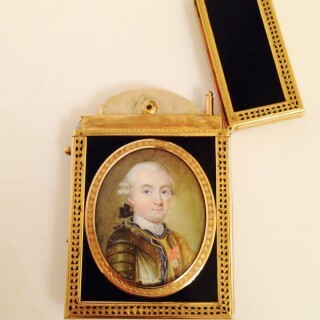 The miniatures are believed to be that of the Marquis Jean Francois de Rochedragon and his wife.